Your website is an interconnected set of information that’s been fine tuned to present your products or services to potential customers. They can find everything they want: How good you are at what you do, how your products will work for them, what services you provide. But then it’s time to buy. What then? Well, if you’re selling online the next step is easy: put what you want in a cart and head for the checkout. But you’re not selling online. You’ve got a dealer network or sales representatives that potential customers need to contact. Now you need to get your potential customers in contact with the person than can close that sale. That’s where the dealer locator comes in. 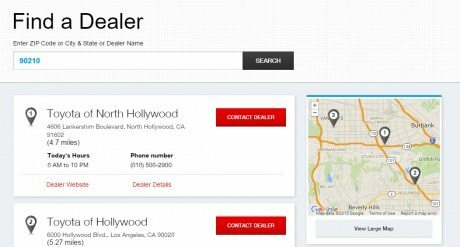 In its simplest form a dealer locator is a list that a user can scan to find the representative assigned to their area. But that’s not very user-friendly and, for longer lists, is not very usable. Since dealers are generally assigned to areas, one good presentation is to allow a user to indicate their region and show only the dealers assigned to that area. A map is often used to allow users to select the region, since most users will immediately recognize their county, state, or even country. There are some usability concerns with this approach, however. Western and Midwestern states are usually large enough to be selected, for example, but many Eastern states are too small to be seen easily, let alone be selected. The solution is to give a user a second option to select a region, a dropdown list or text field to enter more information. These additional features are immediately recognizable and understood control on the web and has the added benefit of being accessible to assistive technologies. The secondary options need to include all of the available regions and will allow the dealer locator to work even on mobile phones. From here you can add a number of features. If you have physical stores, for example, you can set up a “Closest to you” type search or sort. Or you can show locations with a pin in the map and allow multiple selections per region.